Too often a strategic plan is merely a grab bag of goals loosely tethered to a vision. We say yes to everything to make everyone happy. Because we can’t say no we don’t have a true sense of strategic direction. The resulting plans are simply aspirational or actually quite tactical, or both. And then we wonder why our plan sits on a shelf. The defining element of Corona’s work is its focus on strategy. 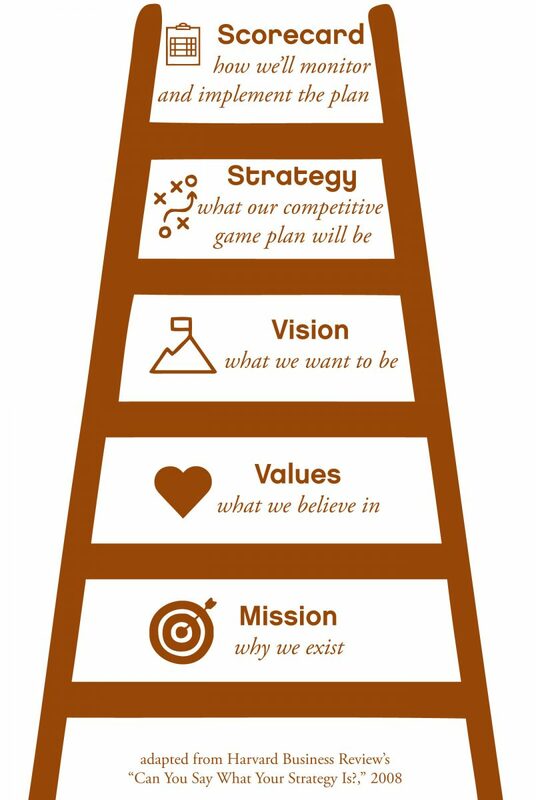 Strategy connects your mission, values, and vision with your future goals and success measures. Without it you are left with only the grab bag. Achieving strategic clarity isn’t easy. It requires a robust and data-driven analysis of your organization’s capabilities, customers, and competitors in consideration of your external context. Corona’s proprietary process incorporates all four elements required to identify each client’s distinctive sweet spot. We combine this with a tailored, hands-on process custom-designed for your needs. Corona’s proven approach to achieving strategic clarity rests in its insights-driven and empathy-based analysis of these elements. The process builds collective understanding of and ah ha’s about the strategic issues because it focuses on customers, markets and more. We zero-in on the forces, trends and conditions that will drive or shape your strategy. In addition, Corona applies our own proprietary frameworks, such as the Synergistic Business Model (pdf) in our consulting engagements. Corona is differentiated by our ability to originate insights. The internationally acclaimed design firm IDEO states that insights reveal an ability to see and understand the true essence of something. By nature, insights are authentic. No wonder we think of them as the eponymous “ah ha” moment. What does that mean for you? We will be able to discern what is most compellingly and distinctively true for your organization. That distinction will be reflected in your tailored strategy and the goals required to implement it successfully. Along the way we’ll build commitment and excitement for implementation. No other firm combines the range of experience, depth of expertise, and commitment to best practices that Corona brings to each strategy planning engagement. We are unparalleled in this market. Need assistance from a strategic advisor? Contact Corona to discuss our chief strategy officer services (pdf).